The convention special room rate is: $169.00 + tax, and includes free parking. Book your room ASAP! Rooms are in short supply due to the many long-term guests living in the hotel following the devastating fires in Santa Rosa late last year. Disregard any mention on your reservation of parking costing $8.00. The hotel has confirmed our rate includes free parking. We encourage you to register early as that will help the Convention Committee with their budgeting and scheduling. The registration fee was kept very low to enable attendance by members on a tight budget. For those driving back and forth, know that there is NO parking charge at the Hotel (typically $20/day at many hotels in the Bay Area). 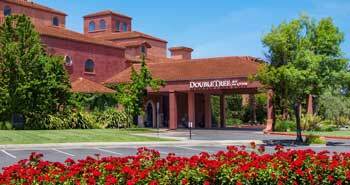 We encourage attendees who want to rent a room to please stay at the DoubleTree. That will help fill the quota on the room blocks to which we agreed in order to get free Convention facilities. We negotiated a room charge much less than the Hotel typically charges. Please check the News & Updates page on the website often for the latest information. For those who prefer alternate bookings, we encourage you to make your reservations soon, as those rooms are quickly gobbled up by tourists and long-term residents living in hotels and motels following the devastating fires in Santa Rosa late last year. It is important to note that the Convention Committee committed to a block of rooms as the incentive to get access to all of the space needed for the clinics, contests, banquet and other events offered to convention attendees. If we don’t fill the room block as required by our contract with the Hotel, it will cost the convention a substantial additional amount. We priced the convention to keep it a low cost event for our attendees. Please help us ensure this low cost by staying at the convention hotel. We're sure you will be pleased with your decision.